Incineration is complete combustion, which is the rapid exothermic oxidization of combustible elements in sludge. Dewatered sludge will ignite at temperatures of 420 to 500°C (788 to 932°F) in the presence of oxygen. Temperatures of 760 to 820°C (1400 to 1508°F) are required for complete combustion of organic solids. In the incineration of sludge, the organic solids are converted to the oxidized end products, primarily carbon dioxide, water vapor, and ash. Particulates and other gases will also be present in the exhaust, which determines the selection of the treatment scheme for the exhaust gases before venting them to the atmosphere. The principal advantages and disadvantages of incineration over other methods of sludge stabilization are listed in Table 8.3. 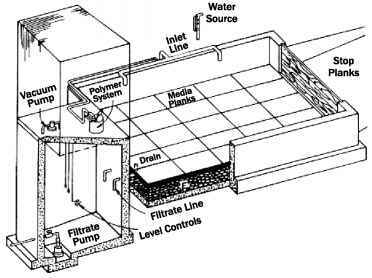 Sludge is incinerated if its utilization is impossible or economically infeasible, if storage area is limited or unavailable, and in cases where it is required for hygienic reasons. One of the principal parameters of sludge incineration is the sludge moisture. Sludge cake with 30 to 50% solids (50 to 70% moisture) is autogenous; that is, it can be burned without auxiliary fuel. Sludge cake with 20 to 30% solids (70 to 80% moisture) may require an auxiliary fuel for combustion. Therefore, before incineration, the moisture content of the sludge should be reduced by mechanical dewatering or thermal drying. 1. Reduces the volume and weight of wet sludge cake by approximately 95%, thereby reducing disposal requirements. 2. Complete destruction of pathogens. 3. Destroys or reduces toxins. 4. Potentially recovers energy through the combustion of waste products, thereby reducing the overall expenditure of energy. 1. High capital and operating costs. 2. 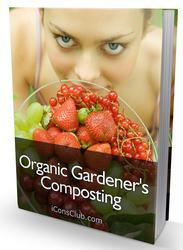 Reduces the potential beneficial use of biosolids. 3. Highly skilled and experienced operating and maintenance staffs are required. 4. If residuals (ash) exceeds the prescribed maximum pollutant concentrations, they may be classified as hazardous waste, which requires special disposal. 5. Discharges to atmosphere (particulates and other toxic or noxious emissions) require extensive treatment to assure protection of the environment. Another important parameter of sludge incineration is the heating value of sludge. It represents the quantity of heat released per unit mass of solids. The amount of heat released from sludge is a function of the types and combustible elements present in sludge. The primary combustible elements in sludge (and in most available auxiliary fuels) are carbon, hydrogen, and sulfur. Carbon burned to carbon dioxide has a heating value of 34 MJ/kg (14.6 x 103 Btu/lb), hydrogen has a heating value of 144 MJ/kg (62 x 103 Btu/ lb), and sulfur has a heating value of 10 MJ/kg (4.5 x 103 Btu/lb). Consequently, any changes in the carbon, hydrogen, or sulfur content of sludge will raise or lower its heating value. Table 8.4 shows the heating values of various types of sludge, grease and scum, and screenings. The process of sludge incineration in furnaces can be divided into the following stages: heating, drying, distillation of volatile matter, combustion of the organic fuel matter, and calcination to burn the residual carbon. Heating the sludge to 100°C (212°F) and then drying it at about 200°C (392°F) consume the principal quantity of heat and are generally required for the incineration process. These parameters also affect the selection of the size of the main and auxiliary equipment and consequently, determine the cost in general. In the course of moisture evaporation in the drying zone, volatile substances are liberated together with the moisture, which sometimes results in objectionable odors. The combustion of the sludge takes place at temperatures between 200 and 500°C (392 and 932°F), due to the thermal radiation of the flame and the incandescent walls of the combustion chamber, as well as the convection heat transfer from the exhaust gases. The calcination of the ash fraction of the sludge is completed by its cooling to a temperature at which it can be removed from the site. The design temperature in the furnace should not exceed the melting point of ash [usually, about 1050°C (1922°F)] and should not be below 700°C (1292°F), thus providing reliable deodorizing of the gases. Systems for sludge incineration should provide complete combustion of the organic fraction of the sludge and utilization of the heat of the exhaust gases. Furnace selection for combustion of dewatered sludge is determined by sludge moisture content and the noncaking nature of the carbonized residue. The first property excludes the possibility of combusting the sludge directly in a flame or in cyclone furnaces without predrying, and the second property excludes the possibility of combusting the sludge on grates; thus, at the present time, multiple-hearth, fluidized-bed, and rotating drum furnaces are most often used. These furnaces are described in the following sections. 1 - Belt conveyor, 2 - Sludge charging hopper, 3 - Screw feeder, 4 - Multihearth furnace, 5 - External furnace, 6 - Draft blower, 7 - Furnace shaft, 8 - Cooling blower, 9 - Vent, 10 - Recirculation pipe, 11 - Scrubber, 12 - Blower,13 - Stack, 14 - Ash tank, 15 - Ash slurry pump, 16 - Pnuematic transport blower, 17 - Gate feeder,18 - Cyclone discharge device,19 - Ash discharge hopper, 20 - Gas regulator unit, 21 - Fuel gas pipe, 22 - Water pipe, 23 - Ash pipe, 24 - Wastewater pipe, 25 - Air pipe. Figure 8.7 Flowchart of multiple-hearth incineration. cylinder 6 to 8 m (20 to 26 ft) in diameter lined internally with refractory brick or heat-resistant concrete. The furnace is divided vertically into seven to nine refractory hearths. A vertical rotating shaft passes through the center of the furnace, to which the horizontal frames of the rake mechanisms, made of heat-resistant cast iron, are affixed. Each hearth has material transfer openings located alternatively on the periphery of one hearth and in the center section of the adjacent hearth. The sludge moves by conveyors into the charging hopper and then onto the uppermost hearth of the furnace. The sludge is moved by rakes into the transfer openings, it drops to the next lower hearth, and continues its travel to the lower hearths. This provides continuous movement of the sludge mass in the opposite direction to the hot combustion air. The use of rake mechanisms to move and break up the clumps in the sludge intensifies the drying and combustion processes. The vertical shaft and the rake mechanism frames are hollow and are cooled by the air supplied by a blower. A fraction of this air enters the ash-cooling zone through a special air pipe and then goes to the sludge combustion zone. A multiple-hearth furnace operates with a supply of 50% excess air. The quantity of air is usually controlled automatically by monitoring the oxygen concentration in the exhaust gases by means of an oxygen analyzer. For ignition and also to maintain stable operation, the furnace is equipped with three or four burners and a forced-air supply. The upper chambers of the furnace constitute the moist sludge drying zone, where the principal part of the moisture is evaporated. In the middle chambers, the organic sludge matter is combusted at a temperature of 700 to 900°C (1292 to 1652°F), and in the lower chambers, the ash is cooled before being discharged to the ash hopper. The ash from the hopper can be transported either in dry form (by pneumatic conveyance) to the ash hopper and then to the ash dump (by truck), or in wet form together with the dust collector ash to the sludge beds or ponds. Countercurrent movement of the moist sludge and combustible furnace gases in the drying zone results in cooling of the gases to 250 to 300°C (482 to 572°F). The gases are discharged to the dust scrubber and vented to the atmosphere by a blower. Volatile substances are almost absent in the early stages of drying. Their intense liberation occurs in direct proximity to the zone of combustion of the principal mass of sludge, where it burns almost completely. Experience with operation of incinerators in Europe and Russia indicates that during normal operation of the furnace, the exhaust gases have no unpleasant odors. If necessary, moist gases discharged from the drying zone can be deodorized using a special afterburner, either separately or in the furnace proper. The advantages of multiple-hearth furnaces include combusting both primary and secondary sludge, as well as trash from screens, scum from settling tanks and oil separators, dirty grit from grit chambers, and industrial wastes. They are characterized by their simplicity of service and by the reliability and stability of operation during significant variations in the quantity and quality of sludge treated. The furnaces can be installed in the open air. The drawbacks of multiple-hearth furnaces include high capital cost, large area required, presence of rotating mechanism in the high-temperature zone, and frequent failure of the rake devices. Fluidized-Bed Incineration Fluidized-bed furnaces are well known in drying and roasting technology in various industrial fields. The furnace, a vertical steel cylinder lined internally with refractory brick or heat-resistant concrete, consists of a cylindrical furnace chamber, a lower conical section with an impermeable air distribution grate, and dome-shaped crown. Heat-resistant quartz sand 0.6 to 2.5 mm in size is placed on the grate to a depth of 0.8 to 1 m.
The turbulent (fluidized) bed in the furnace is formed when air is blown through the distribution grate at a rate at which the sand particles move in a turbulent manner and appear to boil in the flow of gas. The air is supplied by a blower to a recuperator, in which it is heated by the exhaust gases leaving the furnace to a temperature of 600 to 700°C (1112 to 1292°F). The heated air enters under the distribution grate at a pressure of 12 to 15 kPa (1.7 to 2.2 psi). The design of the furnace amounts to determining the material and thermal balances of the sludge combustion process, establishing the geometric dimensions of the furnace elements, and the quantities of auxiliary fuel, air, and exhaust gases. The dimensions of the furnace are determined from the volume of the sludge combusted and the air velocity in the distribution grate. This velocity depends on the hydrodynamic regime of the furnace operation and size of the sand bed as well as the properties of the sludge (moisture, non-combustible solids, and ash size distribution). The quantity of air required for complete oxidation of the organic matter in sludge is determined from the sludge's ultimate composition. 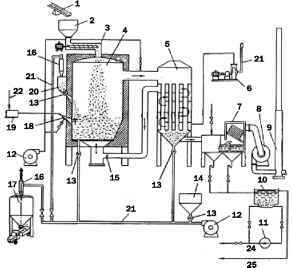 Figure 8.8 presents a flowchart of an incineration system with a fluidized-bed furnace. The dewatered sludge with moisture of 60 to 75% is fed by conveyors into the charging hopper and then into the furnace at the top. Passing through the furnace chamber, in which the temperature is 900 to 1000°C (1652 to 1832°F), the sludge is dried and dispersed in the fluidized bed, where it is thoroughly mixed with the incandescent quartz sand. This results in the breakup of sludge agglomerates, instantaneous moisture evaporation, separation of volatile organic matter, combustion of carbonized residue, and calcinations of the mineral fraction. Due to the intense mass and heat transfer, the entire process occurs in less than 1 to 2 minutes. The volatile fraction of the sludge combustible matter is completely incinerated above the fluidized bed, and as a result the gas temperature is raised. 21 - Air duct, 22 - Fuel gas pipe, 23 - Water pipe, 24 - Ash duct, 25 - Wastewater pipe. Figure 8.8 Flowchart of fluidized-bed incineration. furnace with the flow of exhaust gases, which go to the recuperator (air pre-heater). To decrease the temperature of the exhaust gases to 900°C (1652°F) before the recuperator intake, there is a forced supply of cold air, the quantity of which is controlled by an automatic system. The air, forced in under pressure, enters the space between the recuperator tubes and is directed in a crosscurrent-countercurrent manner. To provide such flow patterns, the space between the recuperator tubes is separated by horizontal partitions. The dust-containing exhaust gases cooled in the recuperator go to a wet scrubber, where ash and dust are removed and the gases are vented to the atmosphere. Ash handling is similar to the system described for multiple-hearth incineration. The heated air, passing through the grate of the fluidized-bed furnace at the design velocity, fluidizes the bed and maintains the required combustion temperature. When the calorific value of the organic sludge fraction is not adequate to maintain the combustion process, auxiliary fuel is injected into the furnace through side burners. Pyrofluid, a modified technology of a fluidized-bed furnace developed by Omnium de Treatment et de Valorisation (OTV, France), has been in operation since 1999 at the city of St. Petersburg, Russia, for the incineration of a mixture of dewatered primary and activated sludge. The incineration system consists of four lines and can treat a total of 250 tons/day of dry sludge solids. Each line has a Centrypress with polymer conditioning devices for sludge dewatering to 28 to 30% dry solids, an incinerator, a heat recovery and utilization system, an ash removing system, and a furnace gas wash and neutralization system. The furnace has two main chambers: a lower fluidized-bed chamber with quartz sand medium and an upper reactor. Dewatered sludge is pumped to the fluidized bed and air heated to a temperature of 500 to 600°C is introduced. Particles of dried sludge and sand at temperatures of 710 to 770°C are then taken to the upper reactor, where the temperatures reach 880 to 900°C. Particles of sludge are burned in this reactor, but the heavier sand goes down back to the fluidized bed. The exhaust gases contain the ash, which is separated in a boiler-electrofilter system. After acidity and alkali neutralization, the gases are cooled to 130°C and exhausted to the atmosphere. The concentration of oxygen in gases is kept at 6%. Ash at a temperature of 250°C is mixed with the water used for gas neutralization in a screw loader to concentrate it to 25 to 30% solids. Each incinerator uses 1000 to 1500 m3/d of natural gas. In 2000, the cost of incineration was $50 to $60 per ton of dry solids. Rotary Kiln Incineration Rotary kilns (or drum kilns) are often used in various fields of industry and are mass-produced. The kilns are used most often in the calcination of cement clinker and claydite and for incineration of sludge mixed with municipal solid waste (co-incineration). Figure 8.9 is a diagram of a rotary kiln incineration system. The drum is installed with an inclination of 2 to 4° in the direction of the external furnace at the lower end. The furnace is cylindrical in shape, lined with refractory bricks, and equipped with gas-oil burners. The furnace is rolling on rails, which aids repair of the drum and replacement of the lining when required. The dewatered sludge (mixed with municipal solids waste for co-incineration) is charged at the upper end of the drum. The sludge dries as it moves through the drying zone and burns in the incineration zone with the liberation of heat. The hot ash falls through an opening in the external furnace chamber and enters the air cooler, from which it goes by pneumatic transport into the receiving hopper and is then hauled to the ash dump. The ash is sometimes used as a conditioning agent in dewa-tering the sludge. 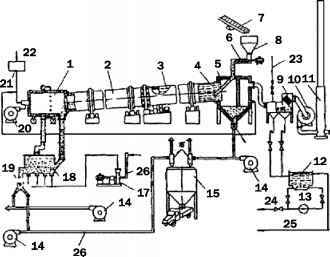 1 - External furnace, 2 - Rotating kiln, 3 - Vane fin, 4 - Spiral intake fin, 5 - Final combustion chamber, 6 - Screw feeder, 7 - Belt conveyor,8 - Sludge charging hopper, 9 - Scrubber, 10 - Blower, 11 - Stack, 12 - Ash tank, 13 - Ash slurry pump,14 - Pneumatic transport blower, 15 - Ash discharge hopper, 16 - Cyclone discharge device, 17 - Air blower, 18 - Air cooler, 19 - Gate feeder, 20 - Draft blower, 21 - Gas control unit, 22 - Gas pipe, 23 - Water pipe, 24 - Ash pipe, 25 - Wastewater pipe, 26 - Air pipe. Figure 8.9 Flowchart of rotary kiln incineration. temperature of the exhaust gases is 200 to 220°C (392 to 428°F), and moisture of the sludge decreases from 65 to 85% to 30 to 40%. In the combustion zone, the length of which usually does not exceed 8 to 12 m (26 to 39 ft), the temperature reaches 900 to 1000°C (1652 to 1832°F). The advantages of rotary kiln incinerators include low emission of heat and low emission of particulates with the exhaust gases, the possibility of treating sludge with high ash and high moisture, and the possibility of installing the rotating section of the kiln in the open air (the furnace section and the charging chamber are usually in buildings). The drawbacks are their cumbersome size, substantial weight, high capital cost, and relative complexity of operation. Emerging Technologies A new efficient technology for thermal drying and incineration of sludge has been studied in Russia. The technology included raw sludge thickening with polymers, centrifugal dewatering, and thermal drying and incineration by using low-temperature plasma without oxygen. Low-temperature plasma is also used for extraction of heavy metals from sludge. Heavy metals are generally insoluble; they usually are present at higher levels in sludge than in wastewater and concentrated even further by the dewatering of sludge. The experiments showed that heavy metals could be extracted from sludge by evaporation at increasing temperatures over time. Different metals have different temperatures for melting and boiling. Table 8.5 lists the melting and boiling points of heavy metals of concern in sludge. These metals are extracted by using low-temperature plasma with catalysts. Various temperatures of the plasma allow extracting the different metals. The cooling of the vapor in reactors lets the metals separate as pure metals. This process is initiated by treating the dewatered sludge at low temperatures between 100 and 500°C. Once heated, the water evaporates, and then the organic substances burn off. The high-temperature process (500 to 3000°C) is followed by melting, boiling, and separating the metals by cooling the vapor from the reactor. 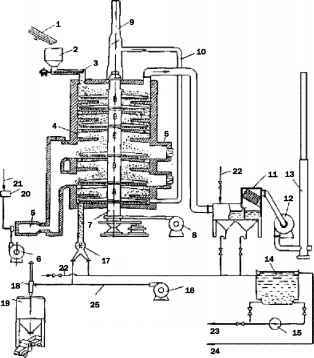 Another technology is a modified cyclone furnace for dewatered sludge cake incineration. Cyclone furnaces are used for combustion of liquid or finely dispersed dry materials in spray form. They have not been used for the combustion of dewatered sludge, due to the technical difficulties of pulverizing the sludge in the cylindrical furnace chamber. However, this does not exclude the possibility in principle of using cyclone furnaces for this purpose. Since the combustion of sludge in liquid form is economically infeasible, the sludge should be subjected to predrying and thorough grinding. Thermal drying can be conducted in opposing jet dryers or fluidized-bed dryers. Efficient systems for combustion of sludge make use of the furnace gases from the cyclone furnace to dry the sludge. The incineration system includes a dryer, sludge grinder, cyclone oven, gas deodorizing chamber, scrubber, blower, and exhaust stack.